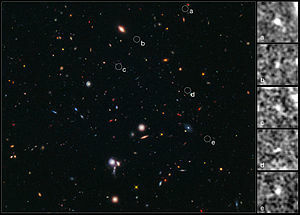 Abell 2744 galaxy cluster – extremely distant galaxies revealed by gravitational lensing (16 October 2014). HAWK-I and Hubble explore RCS2 J2327 cluster with the mass of two quadrillion Suns. Abell 2537 is useful in probing cosmic phenomena like dark matter and dark energy. Abell 1300 acts like a lens, bending the very fabric of space around it. Background galaxy has been gravitationally lensed by the intervening galaxy cluster. "Smiley" image – galaxy cluster (SDSS J1038+4849) & gravitational lensing (an Einstein ring]) (HST). Galaxy cluster SpARCS1049 taken by Spitzer and the Hubble Space Telescope. Abell 2744 galaxy cluster (HST). Magnifying the distant universe through MACS J0454.1-0300. Turbulence may prevent galaxy clusters from cooling ; illustrated: Perseus Cluster and Virgo Cluster (Chandra X-ray). ↑ "Formation of Galaxy Clusters" (2012). Annual Review of Astronomy and Astrophysics 50: 353. doi:10.1146/annurev-astro-081811-125502. Bibcode: 2012ARA&A..50..353K.